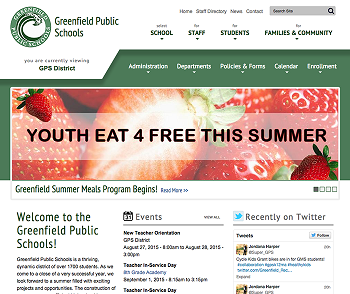 Greenfield Public Schools needed a website that would do a better job at helping them connect with their community. The site needed to provide information to parents related to delays, contact information, school specific information, and other resources such as a calendar. At the same time, the site was to provide students with a “hub” that gives them quick access to resources, tools, email, and more. The existing district website was not friendly for browsing or searching, and was not mobile-responsive. It was dependent on Dreamweaver software, making it difficult to add or train new content contributors; and teachers in the district had their own sites, hosted at multiple locations and services. The school district chose to completely redesign their multi-site web presence, in order to create a universal, consistent look and feel between the district, schools, and teacher sites. The new GPS website included a design that was easy to navigate and accessible to students, families, community and staff; included expanded calendar features; and integrated social media. The new design, with the use of more photography throughout, reflects the learning and activities at Greenfield Public Schools using a fresh approach. The website development process included content testing in small and large groups, including a final twenty-person user test in June; with faculty, staff, PTO, and student council members. This testing resulted in feedback that assisted in the fine-tuning of the design. Multiple administrators and administrative assistants in the district received website management training to provide updates moving forward, and the site went live. Feedback has been highly positive for the new user-friendly look and design. "The site design reflects the process of community engagement, including 203 participants in the Communications Survey, the Superintendent's listening session, and also a trial session at Greenfield High School. The new website has gotten great response. "